We offer a wide range of caps to suit any chimney: round, square, rectangle or multi-flued. Custom built models are also available for challenging installations. We offer chimney caps in copper or stainless steel. Other materials are available, such as galvanized metal and aluminum, but these materials are not as durable. A quality chimney cap is a one-time investment that will protect your chimney for a lifetime. Fireplaces in older homes were built without dampers. Dampers help prevent heat loss by sealing the chimney when the fireplace is not in use. You could be losing $350 to $500 or more out of your chimney, every year, without even knowing it, because of an open fireplace chimney or because of a broken damper. 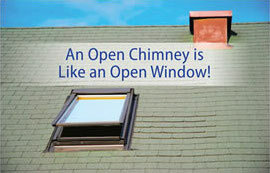 If your chimney’s damper isn’t sealing properly, it’s like leaving the front door open in the middle of winter! You can save up to 30 percent on your heating and cooling bills with an effective chimney damper system. A top mount damper is an effective solution for upgrading an older fireplace chimney. It’s even a great idea for newer fireplace chimneys, as well! We are supplied by a USA-based manufacturer of stainless steel chimney caps that are backed with a lifetime warranty. We carry sizes to fit any type of flue or chimney. Chimney caps prevent animals and birds from nesting and creating a home in your chimney. If animals become stuck in your chimney they inevitably die and cause awful odors, bug infestation, and blockages that can result in chimney fires. Animals entering a hot water tank or furnace chimney flue can cause the release of carbon monoxide gas into your home. The Energy Top chimney damper is a low profile top mounted damper. With the tightest seal of any chimney damper in the industry, this damper helps save energy by preventing heat loss in the winter and keeping air conditioning costs down in the summer. The damper is attached to the top of the chimney flue tile liner. In the closed position, the damper can barely be seen from the ground. It provides a tight fit that seals in your energy and doesn’t allow critters to enter. These types of dampers are easy for homeowners to control and operate. By pulling on the chain that is mounted on the side wall of the fireplace you can release the energy top damper into the open position. The damper is made from stainless steel and aluminum which means it will not rust or corrode, and it is backed by a lifetime warranty. At Chimney Cricket, we have been installing metal chimneys for a very long time and would be glad to speak with you about which chimney liner might be best for your home. If you are interested in a gas log system, we will come out for a visual inspection of your chimney and gas line. Depending on the age of your home, your chimney might or might not have a terracotta chimney liner, which can be a deciding factor on the choice of vented or ventless gas logs. We offer Empire brand line of gas logs that are the most realistic and dependable ventless fire logs on the market today. Empire’s slope glaze burner system disperses flames between each log and forward for a front ember burner bed. All of White Mountain Hearth’s gas logs are made in the USA and come with a five-year warranty. Ventless gas logs can be installed in standard wood-burning chimneys and also in closed off chimneys in older style homes. The ventless gas logs require no vent and are the cleanest high-efficiency product on the market. They are cost effective as they are ideal for home heating and those looking for a more efficient way of heating their home. More than 17 million households in the United States use vent-free gas supplemental heating appliances. These burners are certified by national testing laboratories to meet the latest national health and safety standards and guidelines. The ventless gas logs flame is not as realistic as the vented logs due to a cleaner burning design and lower BTU rating. They are maintenance free, and can come with a remote control or manual control valve. Because there is no venting required, all of the heat generated by the appliance goes directly into the home and their precision-engineered burners provide highly efficient, environmentally clean heat. The vent free gas logs are 99.9% efficient! Vented gas logs are typically installed in chimneys that have terracotta chimney liners and were previously wood burning fireplaces. They offer a beautiful realistic flame that resembles a wood-burning fireplace. They require that the damper be open during use as they release carbon monoxide. They burn less efficiently and not as clean as ventless. Vented logs are not good for home heating, as close to 90% of the heat escapes through the chimney, similar to a wood-burning fireplace. They are mostly for convenience and aesthetic purposes, as they are easier than wood burning but offer a similar experience.